Many schools have "orientation" or "development" courses that are not meant to contribute towards a student's GPA, earned credits/hours, and other academic totals, but which nonetheless might be counted towards full-time status or certain financial aid eligibility requirements. This article describes how to use course settings—found in the Course Catalog and the Course > Info view—to facilitate such courses in Populi. Only for the purposes of this article, we'll be referring to such courses as "development" courses—your school may have a different name for such offerings. Check the descriptions to see which setup will work for your courses. When setting up development courses, you will need to pay attention to one or more of these settings. 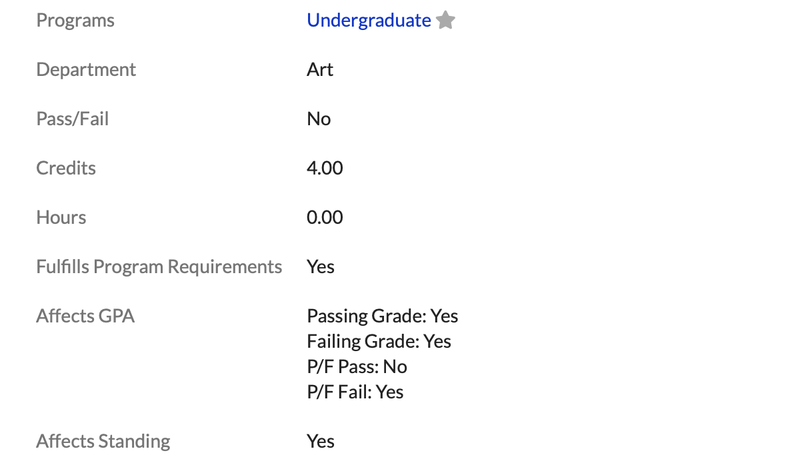 The image above shows the default entries for Pass/Fail, Fulfills..., Affects GPA, Affects Standing, and Affects Full-time Status—most of your regular catalog courses will be using this setup. These courses help students make progress in their academic programs (getting grades, GPA calculations, earned credits, etc.). Program: This determines whether the course appears on a student's transcript—and if the student has multiple programs, it determines which program it appears on. Pass/Fail: When setting a course to Pass/Fail, you'll then need to determine how either grade affects the student's GPA (see below); this setting is also affected by whether you have set up a a pass/fail grade scale. Credits/Hours: Credits/Hours affect the GPA calculation, full-time calculation, attempted and earned units, and so on. Fulfills Program Requirements: This determines whether the course will count towards the degree course requirements for the programs with which the course is associated. When you check it, it will count towards all degrees in all programs listed for the course; if unchecked, it will not count towards any of those degree requirements. Affects GPA: This determines whether a passing or failing grade should be included in the student's program GPA calculation. There are settings for both regular (letter) grades and Pass/Fail grades. Affects Standing: Standing is determined by whether the student's cumulative credits meet the minimum threshold specified in the program's settings. If this is set to No, then the credits/hours for this course will not be considered when Populi checks to see if the student meets the threshold. Affects Full-time Status: The full-time threshold in a program determines whether a student is to be considered full-time in a given academic term. If you set this to No, the credits/hours will not be counted when Populi checks to see if the student meets the threshold. Full-time status can also affect a student's financial aid eligibility. The guides below indicate the most relevant settings for the course mentioned in each description. If one of the above settings isn't mentioned, that's because it doesn't materially affect the way the course will behave. This course's hours/credits contribute to a student's full-time status. Students receive grades for the course, but the course credits/hours do not count towards degree requirements and the grade does not affect GPAs. This course does not need to be graded, nor does it need to appear on a transcript. It is to be excluded from all GPA and attempted/earned credits/hours calculations. On Profile > Student > Course Mapping, un-check the course so it does not appear on the transcript for the student's program(s). If you have a development course you're trying to configure that doesn't fit anything mentioned in this article, contact Populi customer support with the details.